Last year saw him finish Kingsman: The Red Diamond, a six part series drawn by Simon Fraser, published by Image and based on the characters created by Mark Millar and Dave Gibbons. Rebellion also published his Roy of The Rovers drawn by Ben Willsher. He also completed a 50 issue run on DC’s Suicide Squad. 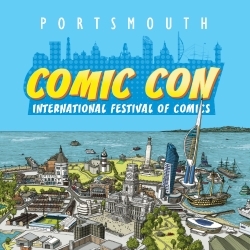 Williams is a comic writer with a very impressive CV and we are very proud he is returning to Portsmouth Comic Con.